Splash Drone shrugs off water and launches rescue flares | It's my life, you're just along for the ride! When drone meets water, the videos can be amazing — except that most drones hate water and can’t even be flown in the rain. However, there’s a new product on Kickstarter called the Splash Drone that isn’t deterred by a little H20. The drone itself is waterproof, as are the circuits, wires and GPS, letting you land and take off from fresh or salt water. The creators (who were responsible for the Mariner Drone product) also built a waterproof gimbal, so that all you need to film around water is a GoPro camera in a waterproof housing. The Splash Drone isn’t the only waterproof model out there, but it can pull off a few other unique tricks. It also packs a two pound payload release mechanism, letting you transfer bottles of, er, water between boats, Netflix-delivery-style. Another neat trick is an mechanism that lets you deploy an emergency flare for up to 15 minutes to get you out of (or into) trouble. Spec-wise, the craft has a 2-axis gimbal, 2.4GHz radio controller, GoPro dive case, GPS assist, follow-me mode, smartphone app-based control, 17 minute flight time and wireless video. A basic DIY kit (without the payload release or other options) starts at $389, while a ready-to-fly bird with those flares and payload release is $799 for early backers. If you’re looking for autonomy, follow-me and mission planning options start at $1,299. 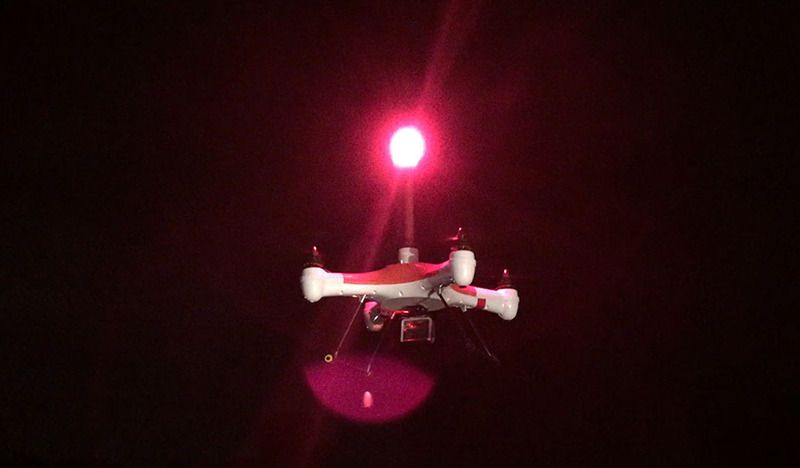 via Splash Drone shrugs off water and launches rescue flares. This entry was posted in Interesting, Tech. Bookmark the permalink.